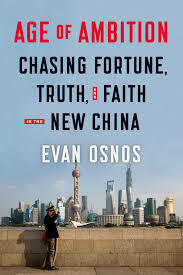 In 2010 the Osnos’ lived in a hutong devoted to spiritual life via it’s name and location, Guoxue Hutong or Alley of National Studies in Beijing – the name from the philosophy, history and politics. “spiritual void” was now undergoing its own boom times. Daoism, Buddhism, folk religions, B’aha’i and Christianity were thriving again (within certain limits). The Falun Gong had been declared a cult and outlawed since 1999. The government continued to be concerned with cults especially what with the internet. Confucius was banned by Mao and the Red Guard almost wiped his presence out, but searching for faith, for moral bearings, he was suddenly resurrected by the Party in the late 20th century. Lao She, an old famous author, was beaten and committed suicide in 1966 – a tragic story. In 2001 a little girl was hit by a van and no one of 17 passers-by stopped to help as she was hit again. Finally an old lady stopped and went to find the girl’s mother. This tragedy made news and Chinese questioned their values and guilt. The passersby said they didn’t notice her – they said they were afraid of getting cheated. Samaritans are blamed and sued and people fear. It happens too often, the witnesses are blamed, the extortionist goes free, mistakes are made by police looking for convictions, the young are even less trusting. No one else had dared touch the little girl so how could they? And the girl died. The old lady who helped her was given attention and money but folks thought it was way more. History – Lei Feng, a hero from Mao’s days, is viewed with cynicism. Sandel encourages his audience, students, readers, to think for themselves – this was new in China and exciting. Zhao Xiao is a converted Christian economist. Christianity, Catholicism and Protestantism, is allowed in China, along with Taoism, Buddhism, Islam, as long as there is no proselytizing. The state runs official versions of Christianity, but there are “house churches” which are sometimes allowed and other times shut down. Falun Gong is still outlawed and there are restrictions on Buddhism and Islam. Christianity is growing fastest including among intellectuals. Reverent Jin Mingri was diverted from a traditional Chinese middle income life by the incident in Tiananmen Square which made him question the state and join the church. He’s been preaching ever since and his parish has grown and he preaches openly now – in a store-front not a house. Zheng Shengtao, a very wealthy industrialist, was shaken by the milk poisoning incident and converted. There are many Christians and the future looks bright for that religion. Ai Weiwei is still somewhat confined – to Beijing, anyway and facing a hefty tax bill. But that was public and he received many contributions the government shut down references to him as well as his own website. He had become a symbol rather than an artist – in fact, his art was panned but he became China’s most famous dissident. Many other artists were scared to join him. The government still controls the arts from painting and music to film and literature. There are protests at all levels about the censorship. Fraud is rampant in academy science. The censorship often runs counter to innovation and productivity. Osnos sides with Han but not without qualifications. Han Han has retired from politics and journalism and moved – he tended to accommodate the government rather than opposed it. Hu Shuli founded another media outlet but it has a lot of competition now – breaking stories of corruption is not big news – lots of people do it. She wants to be a journalist – to do what she does. The student who made the patriotic film, Tang Jie, now wants to criticize China as well as the West and he needs to get involved with politics. He turned to making very patriotic interview video clips for the internet. A shutdown was ordered when the Bo Xilai scandals hit the news – Tang remained a “true believer” and was back up in 5 months – too long for one investor. The Japanese island sale created such intense nationalism that driving a Japanese made car was dangerous. This is in this chapter because it was an opportunity for the Chinese to express the spiritual sentiments – something bigger than yourself. Exciting story – Chen Guancheng, the blind lawyer who was confined to his home in rural China, physically escaped by crawling to safety during which time he broke his leg so he was admitted to the US embassy. The embassy had him go to a hospital from where he phoned his friend that he was unprotected. That friend called another who called another and Chen’s plea was heard by all coming from the iPhone of Bob Fu at a hearing on Capital Hill. Help arrived quickly. Meanwhile, Michael, the English teacher got a new job and new ideas – he believes the Lei Feng myth about 40%. He admires Steve Jobs for making money but also for being an individual with a dream. But the new job didn’t pan out because of too much authority over him and he’s adrift again – with his dreams. But corruption is less tolerated – “Fight corruption too little and you’ll destroy the country. Fight it too much and you’ll destroy the Party.” ( p. 363) So much of it went secret. Internet criticism was clamped down on by arresting the owners of sites with more than 5000 views. The Communist Party has many challenges, mostly human rights types of things but also the fear of “global values” vs innovation and progress – development. Mostly the middle-class folks want reform, a bit more control of their own affairs. But the Party does not embrace change easily and criticism is not permitted except by a very few. China’s labor force is shrinking due to the one-child policy and it’s GDP is still going into investment – investment that may not be profitable and the national debt has sky-rocketed. At the end of Osnos’ stay in Beijing he met the poet-street sweeper Qi Xiangfu and found him online. – nice ending, but I’m not sure if it’s hopeful or not – I think open.